Rainfed paddy fields cover a large area in Northeast Thailand. Rice production there is known to be highly variable, with generally low yields. With the Thai economy developing rapidly since the 1960s, an increasing number of farmers have sought employment in the non-farm sector. As a result, some worry that rice growing in this region might decline or even disappear. In reality, however, it continues to play an important role in ensuring basic food security to rural households. This study investigates technological advances in rice growing during this period of rapid economic growth in Don Daeng village using a dataset spanning approximately 50 years. The results indicate that farmers adopted small-scale agricultural machines, irrigation technologies, land consolidation, high-yielding varieties, chemical fertilizers, and the direct seeding method on their own initiative. These technologies and methods contributed to increasing rice yields and stabilizing production. They also appear to have substantially improved labor productivity, allowing farmers to procure their main food supply from their paddy fields while earning an additional income from the off-farm sector, which could then be reinvested in agriculture. Thus, the interaction between these sectors is currently supporting small-scale rice production in peri-urban villages in Northeast Thailand. In Thailand more than 60% of the area planted with rainy season rice is in the Northeastern region, totaling approximately 6.3 million hectares (National Statistical Office of Thailand 2013, 93). Because most of the paddy fields in this region are rainfed, they produce only one crop per year, whose yield is greatly affected by fluctuations in precipitation. In the mid-twentieth century, the Royal Irrigation Department of Thailand undertook large-scale irrigation development projects in the region (such as the Ubol Ratana and the Lam Pao Reservoirs) to increase rice production (Floch and Molle 2009, 5). However, since the irrigable area makes up only 10–15% of the entire paddy area in the region, irrigation alone had a limited impact on the region as a whole. In the remaining 85–90% of rainfed areas, farmers appear to have sustained agriculture by adopting small-scale technologies that are adapted to local environmental conditions. Therefore, an evaluation of these small-scale development initiatives is essential for gaining a new perspective on the sustainable development of rice production. In addition, the economic orientation of the Northeast is rapidly changing from agriculture to industry, which will have a great impact on the viability of agriculture in the region. Therefore, although this study aims to understand the development of rice production in one particular locality, consideration is also given to a variety of more macro-level socioeconomic forces that the farmers are facing. There is a paucity of information available to provide a detailed understanding of rice cultivation at a specific locality in Thailand, particularly at the village level. Such information can be obtained only through the collection of data over a long period. Don Daeng village in Northeast Thailand is a settlement that relies on rainfed lowland rice production. Continuous observations have been made here since 1961, yielding a unique set of information. Therefore, the present study attempts to describe changes in rice cultivation over more than 50 years by focusing on this village, making use of the accumulated dataset and the findings of previous studies. It has the following main objectives: (1) to describe land consolidation and modification; (2) to analyze the dissemination of new technologies, such as new rice varieties, fertilizers, agricultural machinery, and small-scale irrigation; and (3) to examine the effects of these new technologies on rice production in Don Daeng village. The village of Don Daeng is located in the central part of Northeast Thailand, approximately 10 km south of Khon Kaen city (16°20′42.70″N, 102°51′35.16″E). The Chi River, which is a tributary of the Mekong River, flows through the northernmost part of the village, and most of the agricultural land that is currently being cultivated by the villagers is situated in the floodplain of this river (Fig. 1). The scenery is typical of that found in the Northeast, with scattered trees and shrubs within the paddy fields. The village settlement is nucleated and located on an elevated site adjoining the floodplain, which is also typical of settlements in this region. Source: Funahashi et al. (2006). When Don Daeng was first established in the mid-eighteenth century, farming was mostly for subsistence. By the 1960s the village economy was no longer wholly subsistence oriented, but off-farm activities still accounted for less than a quarter of average annual cash income (Fig. 3). However, after the 1980s the share of off-farm income began to increase, resulting in a wider gap between off-farm earnings and on-farm or rice cultivation earnings (Funahashi 2006, 132). Because Don Daeng is situated in the peri-urban zone of Khon Kaen city, since the 1980s its residents have had good opportunities for off-farm employment while residing in the village. The undulating terrain of the Korat Plateau of the Northeast consists of a succession of small drainage basins. These basins or shallow saucer-shaped watersheds, which are known as nong, exist in various shapes and sizes, and their bottom and lower slopes are occupied by paddy fields. 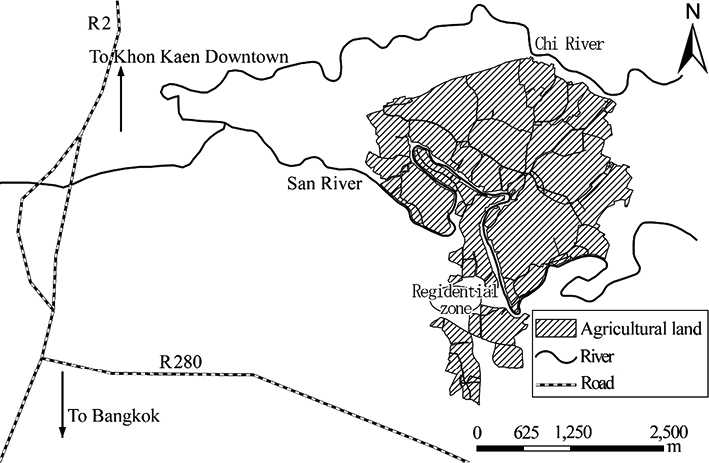 The relationship between the micro-relief of a nong and the traditional rice cultivation system in Don Daeng was studied in 1981 and 1983 (Miyagawa et al. 1985). Fig. 4 presents a schematic diagram of a nong, showing the relief and land use. A nong can be divided into lower, middle, and upper parts. In the case of Don Daeng village, the lower part has the largest area and is relatively high yielding since the soils are most fertile. When the rainy season arrives, this part is planted first. By contrast, the upper part tends to be small, with terraced paddy fields on the slope; rainwater flows down the slope toward the middle and lower parts. Consequently, the upper part becomes ready for planting later than the lower part. In low-rainfall years the upper part may not be planted at all, or if it is planted, the rice may die during a dry period. On the other hand, during flood years, the lower parts are more susceptible to flood damage but the upper parts are able to produce a comparatively high yield. Farm households in Don Daeng village own fields that are distributed in all parts of a nong, from the lower to the upper parts (Fig. 4), meaning that they are likely to be able to successfully harvest at least a portion of the lands in the event of a drought or flood, minimizing the total overall risk (ibid. ; Miyagawa 2006b). Don Daeng village was studied in the 1960s (Mizuno 1981) and 1980s (Kuchiba 1990; Fukui 1994), and a third village study was initiated in 2002 to update the earlier datasets. All of this information was input into a Geographical Information System (GIS) to integrate the previous research data, and a base map for the GIS database was constructed using paddy plot maps from 1981, 1992, and 2005 (Watanabe et al. 2008, 45–52). Since the 1970s, there has been an expansion of areas planted with improved varieties of the non-glutinous rice Khao Dok Mali 105 (KDM105) and the glutinous rice Khao Niao Kho Kho 6 (RD6) in the Northeast (Kono and Nagata 1992, 241–271; Nakada 1995, 523–548). These new varieties have played an important role in transforming an area that was previously noted for its subsistence agriculture to one that undertakes commercial rice production. Don Daeng villagers also replaced the local varieties with KDM105 and RD6. Table 1 shows the drastic change in the number of rice varieties planted in the village from the 1980s onward: 71 varieties were recorded in the village in 1983, while only 3 varieties occupied 100% of the total rice area by 2003. Use of the improved varieties spread as a result of interpersonal communications among farmers rather than information from government institutions (Miyagawa 1995; 1996). According to the household interviews by Funahashi Kazuo (not published), 60% of the total production of the non-glutinous variety was sold to the market in 2001, with the remaining 40% being consumed domestically. Although people in Northeast Thailand do not customarily eat non-glutinous rice, in recent years some tend to prefer it, particularly the younger generation and old people who have difficulty eating hard rice and have diabetes. Therefore, growers do not sell all of it even though they could make a profit from doing so. Chemical fertilizers were used only on nursery beds prior to the 1980s. Their use in the main paddy plots was first observed in this village in 1983 and has since become a common practice. The most popular was urea (46-0-0). By 2004, only 5% of the total area planted with rice did not have chemical fertilizers applied (Miyagawa 2006a). Since then, farmers have used a variety of methods to bring water to their fields. As shown in Table 2, in 1981 only 8% of the total area was irrigated by water drawn from the river by small pumps, whereas in 2003 and 2004 almost 25% was irrigated by the electric pump/canal system and 13% by small pumps taking water directly from the river. However, the remaining 60% of land in 2003 and 2004 was wholly rainfed, and the irrigated land was irrigated only four times during the two-year period of the 2003 and 2004 seasons, indicating that irrigation for rainy season rice is basically supplementary. Nevertheless, the supplemental irrigation plays an important role in avoiding drought damage and allowing rice to be planted simultaneously throughout a nong. The number of paddy plots, their total area, and their average size in 1981, 1992, and 2005 are shown in Table 3. In 1981 there were 8,401 plots with an average area of 663 m2, while in 2005 the number of plots had fallen by two-thirds but their average area had become approximately three times larger. This was due to land consolidation, which became a common practice from the 1990s. A cross-section of a nong was made in 1981 (Kuroda 1981). In 2006 a leveling survey produced another cross-section along the same line. These cross-sections allow us to assess changes over the 25-year period (Fig. 5). Fig. 5 shows that 31 plots had been integrated into three plots. On the left side, six plots in the upper part and two in the middle part had been integrated, and other plots in the middle and lower parts were also consolidated to create one large plot each. Also, the altitude of the bottom part increased over time. Source: Modified from Watanabe (2008). Larger plots are desirable or required for agricultural machines such as power tillers, four-wheel tractors, and combine harvesters, which started to be introduced in the early 1980s. Trees along the bunds of paddy plots were also cut down to make cultivation by machines easier. This type of land modification and consolidation progressed with no financial support from the government. The rice crop performance of each individual plot in Don Daeng village has been recorded every year since 1981 (Miyagawa 2006b). Crop performance was recorded by assigning each plot to one of four grades: “good,” which means that the crop did not suffer any damage from flood/drought or pests/diseases and had a high yield; “poor,” which means that the crop was harvested but the yield was low; “no harvest,” which means that although the plot was planted, no yield was obtained; and “not planted,” which means that the plot was not planted due to either drought or deep water. These observations and recordings were made by a volunteer from the village. 1. “Good plots”: Crop performance was “good” for at least two of the three years. 2. “Poor plots”: Crop performance was “poor” for at least two of the three years. 3. “Crop failure plots”: Crop performance was “no harvest” for at least two of the three years. 4. “No planting plots”: Crop performance was “not planted” for at least two of the three years. 5. “Unstable plots”: Crop performance varied from one year to another. As shown in Fig. 6, in the upper paddy the percentages of “good plots” and “poor plots” were higher in the 2000s than the 1980s, while the percentages of “unstable plots” and “no planting plots” were lower. The primary reason for the improved grade of upper paddy was land consolidation in the 1980s, where previously there had been many small plots with unstable water conditions. By providing irrigation water and consolidating these plots to create one large plot, instability of water condition was largely mitigated, resulting in an increased number of good plots and poor plots. In the lower paddy, the crop performance was mostly good before land consolidation and modification because of a good water supply. The percentage of good plots there was lower in the 2000s than in the 1980s. As shown in Fig. 6, some of the middle part plots in the 1980s were merged into plots in the lower part, as part of land consolidation. This resulted in poor drainage and submergence of seedlings in the lower part, leading to a reduced proportion of good plots. Shifting from the transplanting to the direct seeding method also contributed to the lower grading of the lower paddy plots, because of the greater risk of low germination due to poor drainage. 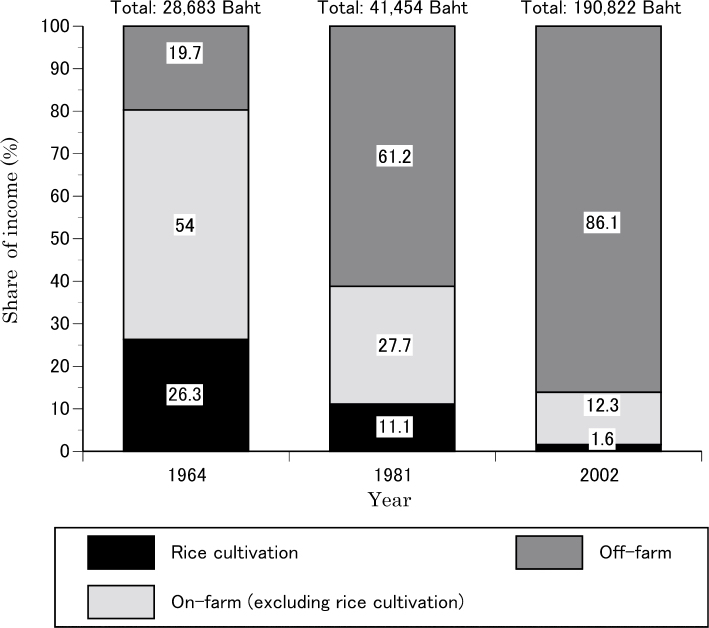 Rice production per harvested area from 1978 to 2005 is shown in Fig. 7. The most striking feature is the reduced gap between low-yield and high-yield years after the late 1980s. The highest yield of 2 t/ha did not change significantly over the 30-year period, whereas the lowest yield remained above 1 t/ha after 1988. Variable rainfall was the major determinant of yield variation in the early 1980s, with drought producing poor yields and the following periods of favorable precipitation producing record-high yields. However, the yield ranged from 1 t/ha to 2 t/ha, although precipitation was similarly unstable from the late 1980s. Furthermore, there was lower variation in yield, which increased the average yield. Thus, it appears that the adverse effect of unstable precipitation was largely mitigated by the introduction of new techniques such as irrigation and land modification, which stabilized water conditions. Source: Modified from Miyagawa (2006c). The types and numbers of agricultural machinery and the number of water buffalo were surveyed in 2001 by Funahashi K. and Shibata K. (2007). The results of this survey were compared with an identical survey in 1981 (Kuchiba 1990). This showed that water buffalo were raised as draft animals for land preparation in 1981, whereas mechanical cultivators had assumed this role in 2001 (Table 4). In addition to reducing the need for human labor, these machines enabled rapid plowing and shortened the time needed for land preparation, allowing a larger area to be planted more quickly after a heavy rain than was possible using animals. As shown in Fig. 6, the number of “no planting plots” became much smaller in the early years of the twenty-first century, particularly in the upper part of the nong. This is the combined effect of improved water conditions and quick land preparation by machines. Table 5 shows that the number of farmers in the village using the direct seeding method increased rapidly since the beginning of the twenty-first century (Miyagawa 2006a), and a similar trend was observed throughout the Northeast (Somkiat and Kono 1996; Hayashi et al. 2009). The adoption of this method, however, resulted in a lower yield because of increased competition with weeds. Farmers were once able to hire neighbors or relatives to transplant seedlings for less than 100 baht (USD3.50 at the 2016 exchange rate) per day. However, in the first decade of the twenty-first century this cost more than doubled due to labor shortages. Consequently, farmers have stopped trying to find the additional labor they need to transplant and instead resort to direct seeding, even though they know that this has lower productivity than the transplanting method. Households that still practice the transplanting method are rare, being restricted to those that have a large supply of family labor. 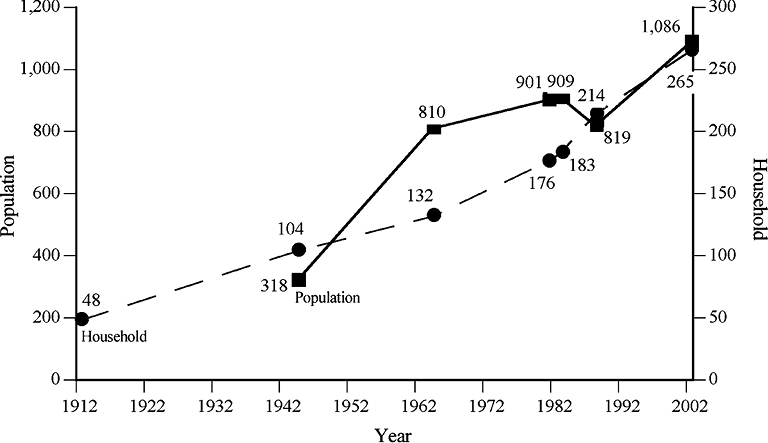 The economy of Khon Kaen city has greatly expanded since the beginning of the 1970s (Glassman and Sneddon 2003). Don Daeng village has been caught up in the city’s economic sphere, with the villagers benefiting from increased access to off-farm sources of income in the city. When job opportunities in Khon Kaen city were more limited, villagers had to seek work outside the Northeast, either in Bangkok or overseas. As a consequence of the increased opportunities for employment in the city and the higher wages that were offered compared with the agricultural sector, labor became short in the village. Consequently, farmers started to employ labor-saving practices. The use of agricultural machinery saved time, which may have contributed to higher labor productivity. The direct seeding method also helped to save labor but led to a reduction in land productivity due to poor germination in the lower paddy fields and increased competition from weeds. In the late 1980s, farmers in this village started trying to increase productivity by using new rice varieties and chemical fertilizers, and by developing new irrigation facilities (Tables 1 and 2). Furthermore, land consolidation and modification created larger and more level plots, which not only improved water management but also facilitated the use of mechanized equipment (Fig. 5; Tables 3 and 4). Thus, the area of unplanted plots decreased thanks to quick land preparation by power tillers and tractors. In Don Daeng village these new technologies have led to a new system of rice farming. These approaches effectively raised the lower limit on crop yields and also stabilized production. However, although the total production of rice has been stabilized, if not increased, the income from rice production has not (Fig. 3). The maximum average yield (2 t/h) remains much lower than the national average (2.88 t/ha). This should not necessarily be considered a negative, however, as the farmers in this village, by adopting new technologies, have succeeded in producing enough rice to meet their own consumption needs; and the expansion of the nearby Khon Kaen urban area has allowed the villagers to diversify their sources of income and improve their own food security by investing that additional income in improving their agriculture. High inter-annual variability in rice yield is a characteristic of rainfed rice cultivation, and it is seen also in Don Daeng. It is such short-term variation, rather than the low long-term average yield (Fukui 1994), that poses a threat to villagers’ ability to meet their subsistence needs. 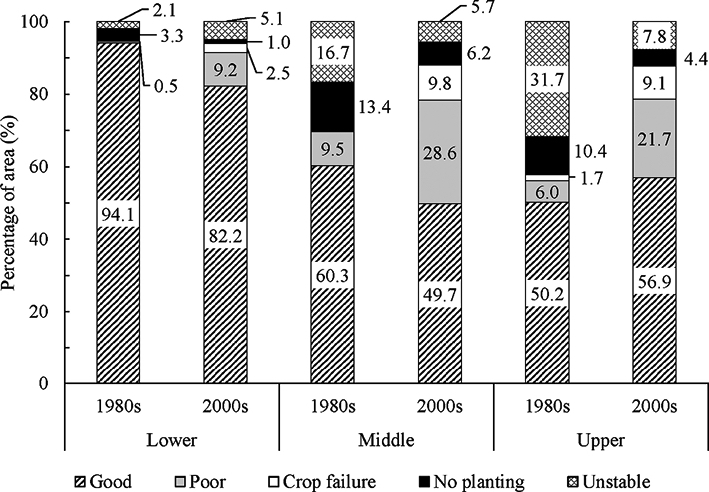 This study clearly demonstrates that the new inputs and technologies that have been used since the 1980s have not increased maximum rice yields; however, they have certainly contributed to increasing the bottom line of rice yield and stabilizing production, which is more than sufficient to meet subsistence needs. The villagers have good opportunities to earn wages while residing in the village, and this secured subsistence is prioritized rather than cash earnings from rice cultivation because it functions as a safety net. The changes in rice cultivation that have occurred in this village since the 1980s reflect the characteristics of rainfed rice—that is, the need for stability rather than a higher yield—as well as the peri-urbanization of the village—that is, the need for self-sufficiency rather than the commercialization of rice. Farmers’ investment in land consolidation, small pumps, and power tillers reflects these aspects. It would be interesting to compare these findings with those from a more remote and truly rural village where out-migration is virtually the only means to earn a non-farm income. This work was supported by JSPS KAKENHI Grant Number 22710248. I would like to express my sincere gratitude to Terry Rambo and several anonymous referees for their helpful advice and criticism. I would also like to thank Jay Parsons for help with English language editing. Floch, P.; and Molle, F. 2009. Water Traps: The Elusive Quest for Water Storage in the Chi-Mun River Basin, Thailand. Working Paper on Mekong Program on Water, Environment and Resilience. Fukui, H. 1994. Food and Population in a Northeast Thai Village. Honolulu: University of Hawaii Press. Funahashi K. 舟橋和夫. 2006. Don Den mura hendo no kisekiドンデーン村変動の軌跡 [Tracing Don Daeng village’s dynamics]. In Don Den mura saisaiho: Tohoku Tai tensuiden noson ni okeru 40 nenkan no dotai kenkyu ドンデーン村再々訪―東北タイ天水田農村における40年間の動態研究 [Revisit to Don Daeng village: Forty years of dynamic research on a rainfed rice-growing village in Northeast Thailand], pp. 83–139. Final Report of Grants-in-Aid for Scientific Research (A), Ryukoku University. Funahashi K. 舟橋和夫; and Shibata K. 柴田恵介. 2007. Tohoku Tai noson Don Den mura ni okeru sonraku keizai no hendo 東北タイ農村ドンデーン村における村落経済の変動 [Changes in economic conditions of Don Daeng village, Northeast Thailand]. Ryukoku Daigaku Shakai Gakubu Kiyo 龍谷大学社会学部紀要 [Bulletin of the Faculty of Sociology, Ryukoku University]: 55–71. Glassman, J.; and Sneddon, C. 2003. Chiang Mai and Khon Kaen as Growth Piles: Regional Industrial Development in Thailand and Its Implications for Urban Sustainability. ANNALS of the American Academy of Political and Social Science 590(1): 93–115. Hayashi, S.; Kamoshita, A.; Yamagishi, J.; Anuchart K.; and Boonrat J. 2009. Spatial Variability in the Growth of Direct-Seeded Rainfed Lowland Rice (Oryza sativa L.) in Northeast Thailand. Field Crops Research 111: 251–261. Kono, Y.; and Nagata, Y. 1992. Occupational Structure and Village Type in Northeast Thailand: A Case Study in Yasothon Province. Southeast Asian Studies 30(3): 241–271. Kuchiba M. 口羽益生. 1990. Don Den mura no dentokozo to sono henyo ドンデーン村の伝統構造とその変容 [Traditional structure of Don Daeng village and its transformation]. Monographs of the Center for Southeast Asian Studies. Tokyo: Sobunshya. Kuroda, T. 1981. Fieldwork data (not published). Miyagawa S. 宮川修一. 2006a. Suito saibai no tokucho 水稲栽培の特徴 [Characteristics of rice growth]. In Don Den mura saisaiho: Tohoku Tai tensuiden noson ni okeru 40 nenkan no dotai kenkyu ドンデーン村再々訪―東北タイ天水田農村における40年間の動態研究 [Revisit to Don Daeng village: Forty years of dynamic research on a rainfed rice-growing village in Northeast Thailand], pp. 25–57. Final Report of Grants-in-Aid for Scientific Research (A), Ryukoku University. ―. 2006b. Long-term and Spatial Evaluation of Rice Crop Performance of Rain-fed Paddy Field in a Village of Northeast Thailand. Tropics 15(1): 39–49. ―. 2006c. Suito seisan no tokucho 水稲生産の特徴 [Characteristics of rice production]. In Don Den mura saisaiho: Tohoku Tai tensuiden noson ni okeru 40 nenkan no dotai kenkyu ドンデーン村再々訪―東北タイ天水田農村における40年間の動態研究 [Revisit to Don Daeng village: Forty years of dynamic research on a rainfed rice-growing village in Northeast Thailand], pp. 59–76. Final Report of Grants-in-Aid for Scientific Research (A), Ryukoku University. ―. 1996. 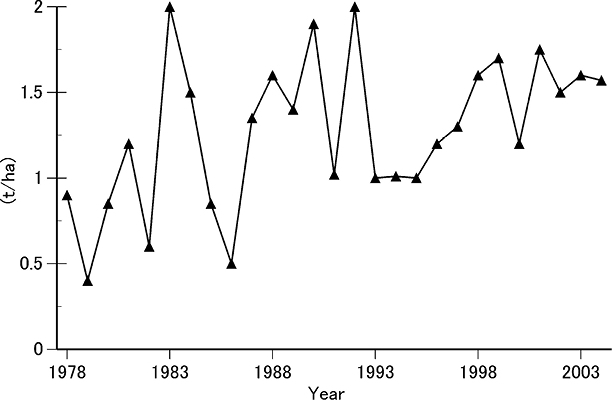 Recent Expansion of Nonglutinous Rice Cultivation in Northeast Thailand: Intraregional Variation. Southeast Asian Studies 33(4): 547–574. ―. 1995. Expansion of an Improved Variety into Rain-fed Rice Cultivation in Northeast Thailand. Southeast Asian Studies 33(2): 187–203. Miyagawa, S.; Kuroda, T.; Matsufuji, H.; and Hattori, T. 1985. Don Daeng Village in Northeast Thailand: Typology of Rice Cultivation. Southeast Asian Studies 23(3): 235–251. Mizuno K. 水野浩一. 1981. Tai noson no syakai soshiki タイ農村の社会組織 [Social organization of Thai village]. Monographs of the Center for Southeast Asian Studies. Tokyo: Sobunshya. Nakada, Y. 1995. Surplus Rice and Seasonal Labor Migration: A Case Study at a Village in Yashothon Province, Northeast Thailand. Southeast Asian Studies 32(4): 523–548. National Statistical Office of Thailand. 2013. Number of Holdings Reporting Land Use and Area of Holding and Region. Agricultural Census Whole Kingdom 2013. Ministry of Information and Communication Technology, Thailand. Somkiat K.; and Kono, Y. 1996. Spread of Direct Seeded Lowland Rice in Northeast Thailand: Farmers’ Adaptation to Economic Growth. Southeast Asian Studies 33(4): 523–546. Watanabe, K.; Hoshikawa, K; and Miyagawa, S. 2008. Alteration of Paddy Plots in the Rain-fed Paddy Field and Their Influences on Rice Production in Don Daeng Village, Northeast Thailand. Irrigation Drainage and Rural Engineering Journal 253: 45–52. 1) These were estimated by various means for the period before the 1960s, while the more recent figures are based on a household interview (Funahashi 2006, 84). 2) 1 rai = 0.16 ha. 3) The present name is Ministry of Science and Technology. 4) When a farmer wishes to use irrigation water, he/she asks the irrigation office and the officer informs the farmer of the schedule. The charge for irrigation water ranges from 35 to 250 baht/hour, depending on the volume of water.